That Similac Ad: A rebuttal of sorts. I know everyone on earth has seen it, laughed at it, cried because of it and inevitable got into some debate from it. I’m not going to get into the psychology of the ad itself as it’s been discussed ad nauseam. I will however briefly explore a wider realm of detriment it imposes: a disguised attempt to end The Mommy Wars. I’m not a fan of the term, but I’ll stick with it since it’s universally known as that. I’m going to dive in about the meatier battles within the war. If you use a stroller over baby-wearing, then roll on. Disposables over clothe? Not worries. Formula vs. breast? He’s being fed, right? How you chose to birth or whether you work or not doesn’t matter. Even though some hold merit over others; these are all the smaller ‘to each their own’ type battles. But under this same umbrella would fall the bigger, more detrimental practices such as CIO (cry-it-out sleep training), corporal punishment and circumcision; which definitely do not fall into the ‘to each their own’ hat when science has proven otherwise. Imagine for a moment, that all discourse on parenting practices ended. That would mean studies on the effects of these harmful practices would halt and anyone speaking against the act would be deemed a judgmental asshat. Yes, there are those extremists who sling mud and run off at the mouth on all sides, but a majority of those are simply presenting information in an attempt to inform, not belittle. This often comes across as attacks to those that are sensitive or have quilt from utilizing them. A complacency in allowing inadvertent (yet sometimes purposefully) harmful practices would be the suppression of further discussions and sharing of pertinent information vital to future generations; which is a grave disservice. I would never, ever say “It’s okay that you struck your child. You love them.” Or pat someone on the back and tell them it was good decision to allow their child to scream themselves to sleep; we’re all just parents after all. I will never condone the circumcision of your son; a practice routinely done mainly in the U.S. and is largely falling out of favor (most of the world condemns the U.S. for it). How can I condone any of these things when they have been proven to cause harm? 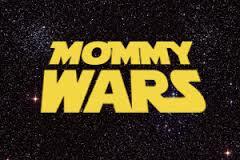 That’s not ‘mommy wars’; that’s fighting for the well being and rights of our children. That’s being pro-child. This ad is eerily similar to one with the photo shoot of the various moms holding opposing signs together in harmony, and now the granola add. In light of these two campaigns anyone who speaks out (on either side) is frowned upon; further suppressing information. As is anyone that doesn’t particularly like the campaigns. ‘How can you not like them and their message?’ they’ll scream. Let us not forget that Similac is a for-profit company that is combating a large breast feeding movement, which is potentially cutting into their margins. I say let’s keep the discussions going, keep sharing the information and parent on. Let’s stop the bashing, name-calling and mud-slinging during these discussions. It is true: we do all love our children and want the best outcome for them.